Please visit the new site and update any bookmarks you have. On May 31, 2003, the Scan Line Corrector (SLC), which compensates for the forward motion of Landsat 7, failed. Subsequent efforts to recover the SLC were not successful, and the failure appears to be permanent. Without an operating SLC, the Enhanced Thematic Mapper Plus (ETM+) line of sight now traces a zig-zag pattern along the satellite ground track (Figure 1). As a result, imaged area is duplicated, with width that increases toward the scene edge. The Landsat 7 ETM+ is still capable of acquiring useful image data with the SLC turned off, particularly within the central part of any given scene. The Landsat 7 ETM+ therefore continues to acquire image data in the "SLC-off" mode. All Landsat 7 SLC-off data are of the same high radiometric and geometric quality as data collected prior to the SLC failure. The SLC-off effects are most pronounced along the edge of the scene and gradually diminish toward the center of the scene (Figure 2). The middle of the scene, approximately 22 kilometers wide on a Level-1 (L1TP, L1GT, L1GS) product, contains very little duplication or data loss, and this region of each image is very similar in quality to previous ("SLC-on") Landsat 7 image data. Figure 2. 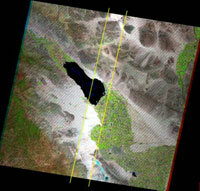 Complete Landsat 7 scene showing affected vs. unaffected area. An estimated 22 percent of any given scene is lost because of the SLC failure. The maximum width of the data gaps along the edge of the image would be equivalent to one full scan line, or approximately 390 to 450 meters. The precise location of the missing scan lines will vary from scene to scene. How do Landsat 7 ETM+ SLC-off data products compare to previous Landsat 7 data? SLC-off Gap Mask Files - These files help users identify the location of the pixels affected by the original data gaps in the primary SLC-off scene. Usability Assessments are available. These documents evaluate the scientific usability of Landsat 7 SLC-off data products. Which images will work best to fill in the gaps? Gap Phase Estimator - This tool allows users to enter the Gap Phase Statistic from two Landsat 7 scenes (found in the scene metadata) to calculate the approximate area that will be filled if the selected scenes are combined.